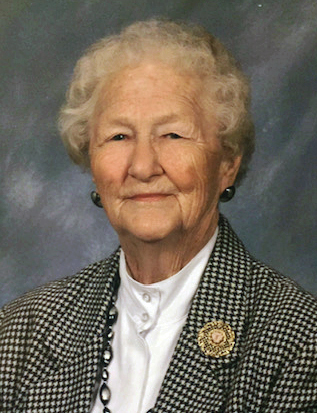 Barbara L. Keele, 93, died Sunday, April 14, 2019, at Russellville Arkansas Nursing & Rehabilitation Center. She was born January 23, 1926, in Sedalia, MO to Riley H. and Ida (Phillips) Dirck. She married Charles Keele on October 4, 1941, in Lexington, MO. Barbara was a long-time member of Our Savior Lutheran Church of Sedalia, MO, where she served faithfully on numerous committees, including the Altar Guild. During her working years, she was a Sales Advisor for Archias Seed Store in Sedalia. She enjoyed gardening, working in the yard, fishing in her pond, baking, and playing checkers and bingo with her great-grandchildren. She was a founding member of the I Can Cope cancer support group at Bothwell Regional Health Center in Sedalia. Barbara was preceded in death by her parents; her husband of 46 years, Charles Keele; her two sons, Larry Charles Keele of St Peters, MO; and, Riley David Keele, Sr, of Gun Barrel City, TX; and two grandchildren, Dawn Keele and Donna Keele. She is survived by her daughter-in-law, Melba (Heimsoth) Keele of St. Peters, MO; seven grandchildren: Terri Hoorman (Ronald) of O’Fallon, MO; Tony Keele (Marlee) of Bowling Green, MO; Fred Keele (Cheryl) of Wentzville, MO; Michael Keele (Dawn) of St. Louis, MO; Riley Keele, Jr., (Autumn) of Russellville, AR; Amy (Keele) Fly of Republic, MO; Chris Keele (Debbie) of Hot Springs, AR; 15 great grandchildren; 2 great-great grandchildren; and many other relatives. Cremation arrangements are under the direction of Humphrey Funeral Service in Russellville. A memorial service will be held at a later date at Our Savior Lutheran Church, 3700 West Broadway Blvd, Sedalia, MO 65301, with burial in Memorial Park Cemetery, Sedalia. In lieu of flowers, the family asks that donations be made to the Sedalia Animal Shelter 2420 S New York, Sedalia, MO 65301; or, Our Savior Lutheran Radio Ministry in memory of Barbara Keele. Internet obituary and online guestbook are available at www.humphreyfuneral.com.